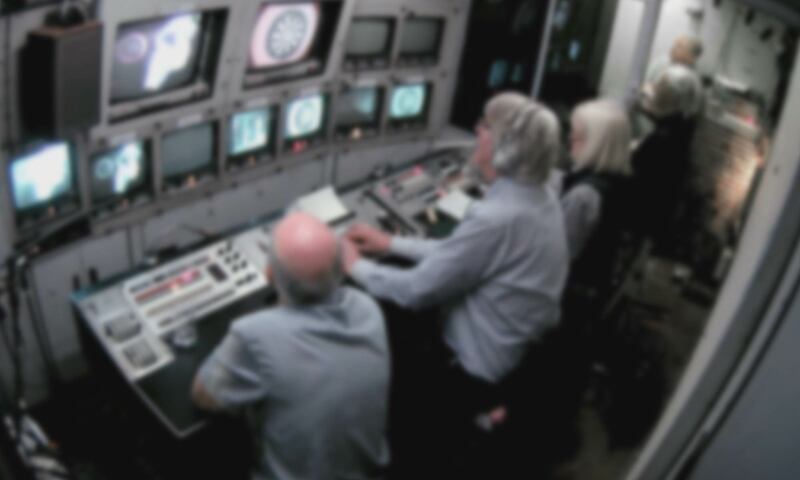 On 13 May 2015, ADAPT invited five television professionals from the BBC’s former Ealing film department to reproduce a standard filming set-up, using the technologies that were available to them between the mid-1960s and 1980s. The day provided an example of a team of skilled professionals recalling in practice how they went about their work. Their activities were recorded on four video cameras, and have been edited as linear accounts now on YouTube. It is recommended to watch the short single screen edited version of the 24 minutes from the arrival of the crew on set. This analysis is a detailed examination of how the crew work together in setting up an interview in a simulated home interior. It takes the crew 24 minutes from their arrival to the moment that the interviewee is seated, ready to be interviewed. This analysis refers constantly to short extracts from the four screen version on YouTube, which can be called up to show the specific actions and exchanges. This ‘simulation’ or ‘reconstruction’ reveals the complexities of obtaining even the simplest piece of television documentary (an interview consisting of a person sitting in a chair answering questions from off camera) in the period from around 1962 to the late 1980s. The standard BBC filming crew of the time consisted of six people, so our participants were: a cameraman – there were no camerawomen at the BBC at that time – (David Whitson), a camera assistant (John Adderley), a sound recordist (Bill Chesneau), an electrician (Alan Muhley), a director (Ray Sutcliffe), and a PA or continuity ‘girl’ (Alex Branson) who was unable to attend at the last minute and was interviewed later. Her role is to document the filming and deal with logistics. The crew have an efficient and established division of labour, each responsible for specific items of equipment and specific actions. Infringements of this division have to be acknowledged and dealt with. The task that this team will carry out is the filming of an interview with a male (‘the Professor’) seated in a chair in his ‘home’, which is actually a studio set dressed appropriately. To expedite this task, appropriate equipment has been provided and is already arranged at the edge of the set. As they remark, they would normally have had to spend some time offloading this from their cars or vans. The equipment consists of a 16mm film camera and tripods; a number of lights with stands, filters etc; a Nagra quarter inch sound recorder with microphones and stands. Camera and sound are recorded separately and will be brought back together in post-production. The colour film being used requires more light than is available in a domestic interior. Bring the interviewee into the space once this preparatory work is finished. This complex process takes the team just 24 minutes, including delays for solving incidental problems. As they carry out the task, they provide explanations or contextual comments about what they are doing. Except at one moment, these comments are secondary to achieving the professional goal that has been set them.